August 15, 2013 -- A new bismuth-oxide-based hand cream recently approved by the U.S. Food and Drug Administration (FDA) might free interventional radiologists to focus more on their patients and worry less about radiation exposure to their own hands. 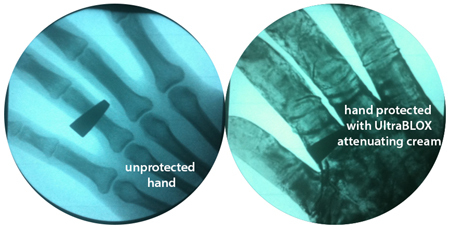 BloXR's Ultra Blox x-ray attenuating cream, which received FDA 510(k) clearance in May and is set to launch nationally on September 9, is designed for use during medical procedures that necessitate exposure of the operators' hands to ionizing radiation, such in fluoroscopy, radiography, or other image-guided interventions. 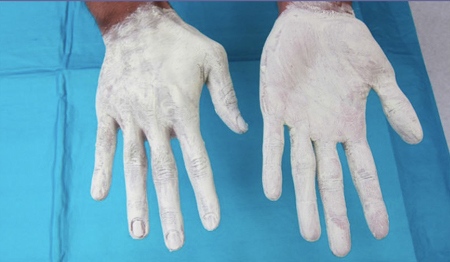 A review of research documents provided by the firm and the FDA's approval letter indicates that thorough application of the cream before an image-guided procedure affords the operator substantial protection from radiation exposure -- on the order of 50% to 85% less exposure to the hands -- at levels up to 130 kVp. Bones are visible on a hand exposed to fluoroscopy without the protection of Ultra Blox x-ray attenuating cream. Bones are not not visible when the cream is applied. All images courtesy of BloXR. "I think this will certainly be a new armament in the safety of people who use fluoroscopy on a daily basis," said BloXR President and CEO Ashok Khandkar, PhD, in an interview with AuntMinnie.com. Complex fractures, complex lesions in interventional cardiology, or very difficult tumor embolizations in interventional radiology can all require lengthy exposure to radiation that the provider would rather avoid, he said. "I spent about 100 days in the [operating room] watching spine surgeons do cases, and they would take 30 or 40 x-ray or fluoro shots to help guide the procedure, and at the end they would make a very dramatic announcement just before closing up the patient," Khandkar said. "They'd say, 'OK, everybody step back from the table -- we're taking an x-ray for the patient file.' And I would kind of say, 'Why are you stepping back now? ... You've already taken 40 x-rays.' "
The x-ray blocking cream offers a safer experience, according to Khandkar. Ultra Blox is based on a 75% bismuth oxide (Bi2O3) ceramic powder mixed with an aqueous carrier that turns the wearer's hands white before they are covered with simple latex surgical gloves in preparation for a procedure. The carrier component of the cream is comprised of lubricants, humectants, surfactants, and emulsifiers, such as glyceryl sterate. Biocompatibility of the lotion and the ceramic powder component was assessed using ISO 10993 protocols, according to a study presented at the 2011 American Academy of Orthopaedic Surgeons (AAOS) meeting. Hands after application of the x-ray attenuating cream. "It's not quite as gooey as it looks," Khandkar insisted. "It looks thick because it's opaque." It actually "feels more like cold cream -- Noxzema or something like that," added Ginny Rowland, BloXR's marketing director. The stark white appearance also helps ensure the even coverage required to maximize radiation protection, Khandkar said. Because it is applied to the hands and worn underneath latex gloves, the cream is far less intrusive than radiation attenuating gloves, which shield the hands from radiation but also inhibit surgeons' movement and tactile sensation during procedures, he said. The limitations of heavier gloves mean that surgeons often refuse to wear them, Khandkar said; many opt to go barehanded to preserve manual dexterity in the operating room. But that practice can lead to long-term risks of overexposure, so in this context, the cream is a big step forward from what surgeons use now, which is usually nothing, he noted. "Most of us, when we go out on the ski slope, we wear sunblock lotion that blocks the ultraviolet spectrum," he said. "Why couldn't we develop a cream that blocks the x-ray part of the spectrum? And that's how this product came into being." Studies support its effectiveness in inhibiting the x-ray portion of the light spectrum, Khandkar said. For example, the study from the 2011 AAOS meeting tracked exposure following application of the cream. In the study, cadavers' hands were imaged on a hand table using a C-arm fluoroscope, simulating an operative field configuration. Each configuration was performed with five treated hands and five controls. Radiation exposure measured subcutaneously (ipsilateral side of the hand) and superficially (contralateral side) showed that the lotion provided 81.5% (p = 0.00000006) and 63.7% (p = 0.0002) attenuation, respectively, compared to bare cadaveric hands. In addition, measured scatter indicated no significant difference in radiation levels. Application of the cream yielded significant radiation exposure reduction, Dr. Smiresh Shah and colleagues concluded. "There was also no significant scatter, which is a key difference from previous glove designs for radiation protection," they wrote in an abstract. Furthermore, orthopedic surgeons on the study team who tried the product on their own hands reported no impairment in tactile sensation, the group reported. In another study, conducted by Dr. Erika Mitchell at Loyola University Medical Center, three fellowship-trained orthopedic trauma surgeons monitored radiation exposure to the dominant hand during 60 trauma cases (20 per surgeon) requiring C-arm fluoroscopy. Each surgeon affixed two dosimeters to the hand before donning surgical gloves -- one covered in the cream and the other left bare. The results showed that each surgeon was exposed to an average of 100 mrem (range, 81-128) in cumulative exposure. Use of the cream was found to attenuate this radiation exposure by at least half (surgeon A, 58%; surgeon B, 52%; surgeon C, 50%). The FDA's 510(k) approval letter stipulates a black box warning on the package, stating that the cream is not intended for use "in or adjacent to the primary x-ray beam or the transmitted beam and should not be used in lieu of a radiographic procedure glove, which is used in radiography for those studies requiring the physician's hand or forearm be in the direct path of the x-ray beam." Rather, the cream is designed for use in situations where the hand is necessarily exposed to radiation to offer "some degree of protection." The agency also cautions against potential glove failure as a result of exposure to the cream, along with potential infection risk to the patient in the event of such failure. It also warns that the attenuating agent "may not be present in high enough concentration" for maximum protection or could "absorb into the tissue, crack or flake off," again reducing protection to the operator. As a result, the cream should be reapplied as necessary, the agency wrote. In Khandkar's view, however, Ultra Blox is a great deal at $38 an application, complete with some peace of mind. "Suppose you have a patient who presents with three or four blocked coronary arteries," Khandkar said. "The procedure can last two or three hours, and the operator is getting irradiated for that length of time. Yes, it's always a concern when the patient is getting irradiated, but patients hopefully get irradiated at the most once or twice in their lifetime. The problem with clinicians is they're chronically exposed for 30 to 40 years ... and it becomes potentially a long-term chronic exposure problem."